A circulation increased by 50%, today, for the new Sole 24 Ore, which is record for adv and aims at vertical targets, but increases its price to 2 euros. With a total of 140,000 copies, the complete graphic and content review of the daily newspaper directed by Guido Gentili begins. The site will present its restyling within the year. The table will no longer be proposed in modules but only with 6 formats. Two more attachments to Friday. 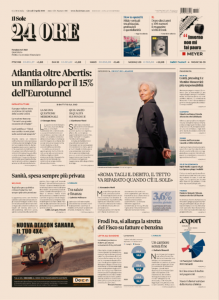 As already repeatedly announced, an all-new Sole 24 Ore debuts today. A newspaper that searches for words, strategies and new graphic solutions to tell our time and guarantee a quick and modern reading. The new Sole 24 ORE, rethought by the director Guido Gentili, therefore radically changes its form and substance, focusing on a new formula for the synthesis and selection of information that facilitates the reading of today’s evolved reader, combined with specialization, which is the brand of a newspaper factory that for over 150 years is, and wants to be even more so, an indispensable work tool for managers, entrepreneurs, professionals and savers. From this point of view, the change involves both the visual aspect, with a simpler and more readable graphic, the editorial concept and the contents: ranging from the choice of selecting news more to that of compacting the sections in one back, from creation of new weekly thematic pages up to the redesign of the numbers of Sunday and Monday. “We focus on the selection of topics and the ability to provide a brief and accurate account of the facts, with the aim of offering readers the true agenda of the facts that must be known. We want to be a different newspaper from the others and a step forward in understanding and explaining the events, providing informed and timely stories supported by numerical analyzes and authoritative opinions of the best Italian and international commentators» explains Gentili, who also directs Radio 24, Radiocor and the newspapers specialists of the Group. The change in graphic features aims to encourage a more immediate and accessible reading, to help the evolution of information towards synthesis and specialization and to confirm Il Sole 24 Ore as a leading newspaper in Italian and European economic and financial information. The first big visible change is, on the front page, the displacement of the head logo on the left, with a more dynamic effect. Then we move on to a modern layout on 7 columns instead of the 8 that have become traditional in recent years, and the adoption of a larger body and a greater line. These solutions allow a clearer hierarchy of news in the page, make the articles more readable and the newspaper more orderly and clear in the display of contents. The font is new: it is called “Sole 24 Serif”, accompanied by the “Sole 24 Sans” stick version for the graphics and the complementary elements of the page. The new font is designed by the Luciano Perondi studio of the CAST foundry, under the guidance of Sole 24 Ore Art Director Francesco Narracci and Sergio Juan – a designer from Barcelona with a long experience in the design of newspapers and magazines – who took care of everything the new graphic project. The first feature of the new Sole 24 Ore is the reorganization in a single back with a different sequence of the main sections: the pages of “Finance & Markets” enter the newspaper and go in continuity with those of “Economics & Business”, thus strengthening the relations between finance and the economy, the banking system and the business world, and allowing to highlight the bonds that characterize the international economic system. A modality, to compact the information, which will count on shorter and more incisive articles, without this calling into question the traditional ability to deepen the newspaper. Regulatory information will continue along the path of a tradition that will be combined with an eye to the future. The evolution of laws, in fact, explains what our country is and what it will be in the near future. Therefore, space to information that explains the rules and to the service information that allows you to evaluate the consequences of your choices (from home to pensions, from taxation to savings, from work to public administration). With, at the center, the historical link with professionals and citizens called to deal with laws and regulations. But also themes to be explored more intensively, such as economic law, privacy and public procurement. The other big news is the weekly schedule: Il sole 24 Ore widens the editorial offer by also looking for new themes that can guarantee a different newspaper for each day of the week. Every day, from Monday to Sunday, the newspaper will have 3 pages dedicated to a specific and distinct theme, with the aim of creating a new line of observatories on key issues for the different managerial functions in companies and among professionals, becoming plus the indispensable daily work tool. The schedule was created to meet the needs emerging from internal research on the entire publishing offer of the Group, completed between March and September 2017 by GfK, and with these indications the new Sole 24 Ore plans to conquer new profiles of readers. It starts on Monday with “.professioni” and “.casa”, which maximize the information dedicated to professionals. Tuesday is the time of “.export”, dedicated to companies that want to conquer the international markets and to all those who work in companies to conquer these new outlets for their goods. On Wednesday it’s up to “. Work”. The focus shifts to company dynamics related to the subject, from contracts to corporate welfare, from recruitment to training. Objective: to reach all those who deal with human resource management in companies. On Thursdays, space, instead, to technologies with “nòva.tech”. “Nòva”, in fact, is doubled. On Thursdays, the pages focus on technological innovations that can have an immediate impact on business management and will be aimed at those who need to take advantage of technological innovations in business processes, while on Sunday the objective looks at the border issues of innovation, with a look on the future. The Friday is dedicated to “.marketing”, which explores the issues related to communication strategies that are adopted by companies, in terms of advertising and management choices. Saturday, however, we enter the weekend with “.moda”. Under scrutiny, the creativity of our country (and not only) with character interviews and reports on trends and changes, even at a global level. Without forgetting the industrial dimension of a sector that has become a driving force in our system. And for all sectors, a common element: maximum attention to travel and chair transfers, corporate reorganization and strengthening. Lastly, Sunday comes “.lifestyle”, which opens up to the themes of good living and well-being: from trips to food and wine, from experiences of living to wellness. With a link of continuity with the pages of the historical cultural supplement of this day, in which the newspaper is really new, with a richer publishing offer and different reading plans. On Sunday, in fact, confirms the historical cultural insert but, in the first back, focuses on a reading magazine full of inquiries and stories on the traditional themes of the Sole 24 Ore (from finance and economics to regulatory evolution) and then open to good living and the pleasures of life with the pages, in fact, of “.lifestyle”. Pages dedicated to food, travel, experiences and collectibles. Even the weekly edition of Monday changes, and it does so starting from the logo of the magazine, which will be vertically to better distinguish it compared to other days and maintain the visibility of the magazine even when the newspaper is cellophanato. On the front of the editorial cut, the new Monday Sun will be the weekly magazine of professionals, of the house, of the “Quick Guide”, a weekly monographic insert that each time will offer a practical overview on a specific topic, and the new “L” Expert answers “, which adopts a new tabloid format to present itself as immediately browsable and usable. The first news, as mentioned, is “.professioni”, a section dedicated to professional activity such as business management. This new area of ​​”studio management” represents a moment of deepening in tune with the professional trends of the moment, particularly in the economic-juridical field, to accompany evaluations, decisions and investments on the most topical issues. The second is “.casa”, a section dedicated to the real estate market, residential and non, and to the universe of professions as agents and real estate brokers, appraisers, condominium administrators, technical consultants, architects and engineers. Finally, the weekly review “Norms & Tributes” that is presented today, within the Sun of Monday, with a strong specialization. The review of the paper daily is accompanied by the initiatives of the digital Sole 24 Ore. The site of the Sun – whose restyling may be ready by the end of the year – is the information of the Sole 24 Ore in real time: with news coverage, in-depth information, interactive articles and video news. The new app launched in April, then, allows access to the site news and the digital edition through a single channel. To this, we add the presence on social media, with new modes of storytelling, and the multimedia dimension of the investigations that will be developed on paper, on digital and on Radio 24, which will also have a new site in the fall. In particular, on the radio front, the different vertices of the new Sole 24 Ore will have a greater synergy with the programs of the issuer that deal with the same issues but with a different approach. On the occasion of the launch, the morning newsletter of the Sole 24 Ore, which will now be called “Daily 24”, will also change, and will have three different versions, the result of the care of a different journalist. From Tuesday to Saturday will be spread “Morning24”, signed by the editor in charge of the site, Marco Alfieri, with stories not to be missed to understand the day, the key issues and possible developments of what happened the day before, from the economy to politics, with a careful look at the world; on Sunday, it will be the turn of “Best24”, curated by Angela Manganaro, to retrace the most important events of the past week; finally, on Monday, here is “Sette24” with the agenda of the week that begins with Alberto Magnani, to have a compass to orient himself. Not only that, in the following days will also be launched “Lifestyle24” which, every Saturday, will introduce readers in the world of good living that is the heart of the new section of Sunday. And then “Domenica”, the newsletter that will guide the prestigious culture weekly of the Sole 24 Ore.
With the new graphic layout also the advertising formats change: following the same logic of rationalization of the contents, more clarity and simplicity will be offered. By eliminating the logic of the modules, the new Sole 24 Ore will offer only 6 formats – full page, half, junior, fourth, foot and quarter – which will guarantee an elegant and orderly impact. «We have found a great appreciation and interest from customers who have presented a preview of the product for both the radical graphic reform, which comes after 10 years from the previous one, and especially for the new editorial schedule, which offers readers but also investors new opportunities. All this happens in the context of an overall path of renewal of the entire publishing offer that meets the changing needs of readers and investors, “adds the Group’s General Manager, Massimo Colombo. There are 50 advertisers in today’s newspaper, for a collection of 560,000 euros that will contribute – given that even for the next two weeks there are excellent signs of interest from the market – to turn decisively to the beautiful performance of the Group in June on the advertising front, even if even the first 5 months seem to have gone discretely. For the occasion, moreover, the circulation is increased by 50% and, therefore, to 140,000 copies, while tomorrow and Thursday the increase will be 30% and 20%. Today’s foliation is 56 pages plus 16 of the “Italia che cambia” dossier; at the same time, however, the cover price is increased by 50 cents to 2 euro (which becomes 2.50 in the days of the annexes) and we must see how much this will affect the circulation, whose success is also entrusted to an editorial offer that will always be more vertical and, therefore, with greater potential for the involvement of specific targets. The offer of the attachments on Friday will also be strengthened, with L’Impresa, which will be relaunched in the autumn, and another attachment to the study, which will alternate over the four weeks of the month with IL (whose recent relaunch has also contributed to the improvement of the collection with its 100 pages of inclusion of the number of debut of the restyling) and How To Spend It. In support of the launch has already started the campaign Simonetti Studio, which will be extended for another two weeks for subscriptions to price blocked and that will expand to the various thematic news for a month.